We do not curently have theatre tickets available for The Waterboys This could be because we have simply sold out or it could be that this show is no longer running. The information on this page remains purely for historical and informational purposes. 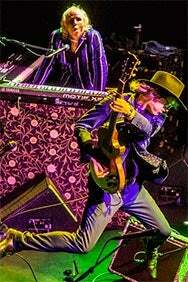 THE WATERBOYS return to British theatres and halls this spring with their spectacular two-part show, featuring the already classic seven-piece line-up they debuted in 2018. The band will take the stage early each night as no support act will be featured, and will play a long and generous set in two halves. Centred as always around the guitar and vocals of Mike Scott, The Waterboys feature electric fiddle maestro Steve Wickham of whom DJ Chris Evans says "I've had Jeff Beck and Jimmy Page on my show but the best guitar solo we've ever had was played on this man's fiddle"; Memphis soul man Brother Paul on keyboards; Aongus "funkiest man in Ireland" Ralston on bass; Jess Kav & Zeenie Summers on backing vocals; and top British drummer Ralph Salmins. They promise an incendiary set comprising brilliant new material and the best of their recent and vintage work. The band's last three albums Out Of All This Blue (2017), Modern Blues (2015) and An Appointment With Mr Yeats (2011) reestablished them as one of the crucial bands currently working out of these islands. Many of their songs including Fisherman's Blues, The Whole Of The Moon and How Long Will I Love You have become modern classics and they remain one of the most unmissable live acts in the world.